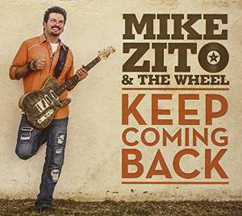 Mike Zito & The Wheel - Keep Coming Back released on the Ruf Records label is a rollicking Blues follow-up to his releases Songs From The Road and Mike Zito & The Wheel - Gone To Texas. Joining Mike Zito are Jimmy Carpenter, Rob Lee, Lewis Stephens, Scott Sutherland, Anders Osborne, Trina Shoemaker, Suze Simms, Riley Zito (Mike Zito's daughter), and David Farrell who keep the Blues moving along nicely on this fabulous 12-track release. Mike Zito & The Wheel - Keep Coming Back was produced by Grammy® Award winner Trina Shoemaker and Mike Zito on the Ruf Records label. I first heard singer, songwriter, blues guitarist Mike Zito when he was performing with his former band, the Royal Southern Brotherhood with fellow guitarist Devon Allman, Cyril Neville, Yonrico Scott, and Charlie Wooten (Royal Southern Brotherhood) and was impressed with his musicianship and distinct voice. Later, learning his back story, I was even more impressed that this major talent was not someone who had it easy, but rather had worked hard to overcome obstacles and move forward with his life with a generosity of spirit. If anyone was destined to sing and play the Blues it was Mike Zito. Anders Osborne writes on the liner notes, "I love Mike Zito! He's got that rare kinda voice that resonates in your soul. All his hardship, life experiences and kind heart oozes out of every note he sings, his guitar playing dances delicately between a contemporary blues virtuoso and an old fashion soul man. Mike continues to impress me with straightforward and honest man songwriting. His joy and grace shines through every record he makes." The 12-track release opens with Mike Zito's catchy title track, Keep Coming Back, with Mike's fast-paced winding steel guitar intro joined by Jimmy Carpenter's wailing sax and Rob Lee setting the drum beat that segues into the lyrics, "I got one foot into tomorrow, One foot in yesterday, My back is aching, Heart is breaking, I still got blues to pay ....Keep coming back; give your burden to the Blues, Keep coming back, Whatta ya got to lose..." that sets the tone for the rest of the release. Next in the play list is Mike's Chin Up, which impresses that one must keep moving on no matter what life deals you, followed by the Mike Zito/Anders Osborne song, Get Busy Living. Mike and the band take it slow and easy on Early In The Morning, which has become one of my many favorites on the release with its slide guitar riffs and chord changes and Mike's lyrics that state each day "nothing's gonna bring me down" with Riley Zito adding her vocals to this amazing track. The song, I Was Drunk, another Zito/Osborne song, cuts deep and touches the heart with its storytelling lyrics and great instrumentals by the band with Anders layering in his vocals and guitar along with Mike, followed by another Zito/Osborne song, Lonely Heart. Other great songs on the release are Girl From Liberty, Get Out Of Denver, written by Robert Clark Seger, which is jump blues at its best with Lewis Stephens pounding the piano with great guitar riffs that kept me moving to the groove, followed by Nothin' But The Truth, and Cross The Border which has some nice harmonies. Mike Zito's imploring What's On Your Mind is another one of my favorites, about a relationship gone sour. When the release closes with the funky cover of the John Cameron Fogerty song, Bootleg, the first thing that you want to do is hit the play button again and give it another listen. (Read the past review of Mike Zito & The Wheel - Gone To Texas). Websites where you can procure Mike Zito & The Wheel - Keep Coming Back are Amazon, Mike Zito, and Ruf Records. © November 2015. Luxury Experience. www.LuxuryExperience.com All rights reserved.